4.31 pm: The solid grey sky made everything look very dull today, including my photos, so I decided to take this colourful shot of a nearby street. The building at the end of the street is the Faculty of Law. This is so lovely. I love those bright colours! Wow - love that place on the right - your cobbles are just brilliant in these street shots as well. 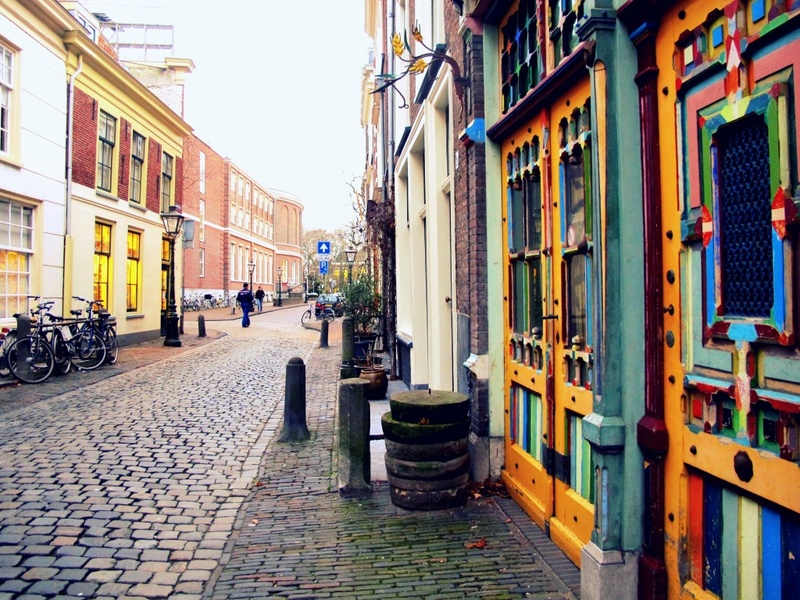 Fantastic colours - love the cobblestones too. love those beautiful vibrant colors and great perspective! Mooi, kleurrijk straatje. Zelfs de straatstenen doen mee! The colors make it look sunny! Love the colors and the details here. Nice shot! LOVE those colors! Charming shot! love the colours and lies Judith! wow wat leuk! typish nederlands straatje! Super door painting going on here. I love all the color in this street shot. Ziet er erg grappig uit! Gewoon een huis of een restaurantje ofzo? More like the Faculty of Design - LOVE IT! I love this shot. Makes me want to be there. I love the vibrant colours here! !